Materials scientists and chemists at Rice University in Houston, with colleagues in Belgium, have created a battery that can be applied as spray-painted layers. Their findings appear in the online journal Scientific Reports. The team led by materials scientist Pulickel Ajayan devised a method for applying five components of a lithium-ion battery — two current collectors, a cathode, an anode and a polymer separator in the middle — in layers. Ajayan’s team then tested the painted-layer battery on a variety of substrates. The positive current collector is made of purified single-wall carbon nanotubes with carbon black particles dispersed in the chemical N-methylpyrrolidone. The cathode contains lithium cobalt oxide, carbon, and ultrafine graphite powder in a binder solution. The anode is a mixture of lithium titanium oxide and ultrafine graphite, also in a binder solution. And the negative current collector is a commercially available conductive copper paint, diluted with ethanol. The middle separator layer is a polymer paint of Kynar Flex resin, poly(methyl methacrylate) or PMMA plastic, and silicon dioxide dispersed in a solvent. Lead author and graduate student Neelam Singh formulated, mixed, and tested various paints for each of the five layered components. The materials were tested for their bonding capabilities by airbrushing onto various substrates including ceramic bathroom tiles, flexible polymers, glass, stainless steel and even a beer stein. Using ceramic tiles, nine spray-painted batteries were connected in parallel, which provided a steady 2.4 volts. One of the batteries was topped with a solar cell that converted power from a white lab light. 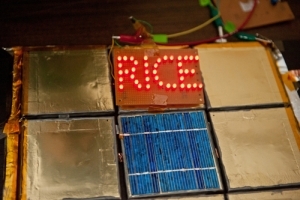 When fully charged by both the solar panel and house current, the batteries alone powered a set of light-emitting diodes that spelled out RICE for six hours (pictured at top). The Rice team has filed for a patent on the technique, which they will continue to refine. One of the sought-after refinements Singh says, are electrolytes that make it easier to create painted batteries in the open air. The following video tells more about the spray-painted batteries.